“Children do not lose their human rights by virtue of passing through the school gates” (Committee on the Rights of the Child, General Comment on ‘The aims of education’, 2001). STOP PRESS UPDATE ……. On Thursday 23rd February 2017 we were assessed for Level 1 and we are pleased to announce that we were judged to have achieved the standard. Well done to our RRSA Ambassadors and the whole school community for their on-going involvement. Out work towards the Rights Respecting School Award is in partnership with Unicef, supporting our School in order to embed children’s human rights in our ethos and culture. We are looking at the UN Convention of the Rights of the Child and are examining how we can put this at the heart of our School in order to improve well being and also helping all our children to realise their potential. 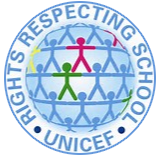 Please follow this link to find out more about the work of Unicef and the Rights Respecting School Award. The Rights Respecting School Award has 3 levels to it. We have had to demonstrate that we have embedded children’s rights into our School’s practice and ethos. We are able to do this through our extremely hard working RRSA ambassadors who represent our children from Reception through to Year 6. This group of young children meet regularly and are instrumental in ensuring that the Rights of the Child are being met right across our School. Their work so far has included presenting a whole school Assembly to all our children and invited parents, they have analysed the responses of over 100 parent questionnaires and decided as a group which of the 54 Articles we would look at specifically at Ingleby Mill. They decided that we would focus on The Right to Education, The Right to Play and The Right to Health. Each class also has their own Class Charter which is a working document that each child across School from Reception to Year 6 has contributed towards and are referred to in relation to each child’s individual Rights and also their own Responsibilities in helping everyone to achieve them. As you enter our School please take the time to look at the wonderful work on display from our Ambassadors, it is both informative and thought provoking. We are very proud to have received our Recognition of Commitment certificate and then more recently our Level 1 certificate which is proudly on display in the school’s main entrance.